Not being able to catch your horse is really frustrating. Chasing your horse down or tricking it before you start each ride is not a positive way to begin your time together. It’s worth spending a little time teaching your horse to be safely caught. There may be a time when you absolutely must catch your horse—such as for visits from farriers and vets, or even something extreme, like an evacuation order. Generally, horses shouldn't be turned out with halters on. However, during this retraining period, you may want to keep a leather crowned halter on your horse, even in the pasture. Horses can become entangled when trying to scratch an ear with a hind foot or can hook a halter on a gate latch and get hung up. Leather halters or halters with breakaway crowns are safer if the horse becomes entangled. If you want to be able to catch your horse, you will have to convince it that being caught doesn’t always lead to discomfort or work. You’ll do this by spending time with your horse that doesn’t involve any of what it perceives as negative experiences. Start by visiting in the pasture or paddock. Clean up manure, check for fences; do anything but approach your horse. If your horse approaches you, don’t reach out and try to catch it. Just let it approach, perhaps sniff at you, and then you walk away. Don’t let your horse walk away from you. You always want to be the final decision-maker in any exchange with your horse. Several brief visits a day will be more effective than the occasional long visit. When trying to approach your horse, don’t march up to it full of purpose and intent. Instead, soften your body language and walk slowly toward your horse. Don’t make direct eye contact. Don’t approach head on (or tail on). Use your peripheral vision and approach at the neck or shoulder. If the horse allows you to get near enough to catch it, spend a little time doing something enjoyable like scratching, massaging, or grooming. Use your knowledge of what your horse likes. When you are done, don’t let your horse conclude the exchange. Decide when you are done, unhook the lead rope, make the horse stand, and then walk away from the horse. If your horse will absolutely not allow you to get near enough to catch it, you’ll have to carve out some free, open-ended time and have your horse in a small paddock or yard. A round pen is too small, and a large pasture will work only if you don’t mind walking for miles. When you approach your horse, and you know it will run away from you, keep it moving. Use a lunge whip as an extension of your arm to cue the horse to move forward. At the beginning your horse may act like this is fun—and gallop, buck, and kick. It may even try to approach you at some point. However, don’t let the horse make those decisions. If the horse tries to stop, tell it clearly and firmly to trot. Ask your horse to halt—or whoa, or whatever term you use consistently—after you see that it is beginning to pay attention to you. It may start looking toward you, flicking its ears, or lowering its head. When it does as you ask, praise the horse and send it on its way. Do this a few times so you know you are getting a consistent reaction to your command. When you see that the horse is halting obediently on command, drop your whip and approach. If the horse stands quietly praise, scratch or pat it and walk away. Send it out at a trot again. Repeat the process until you know the horse will stand and wait for you. Only after you know the horse will stand should you attempt to catch the horse. If it ducks away from you send it on its way and repeat the process. Make sure there is a reward at the end of the lesson if it does stand for you. Put a lead rope on it and lead it to a treat in a bucket, do a little grooming, or give a massage. And then turn it loose in its pasture. The next time you have a moment, visit the horse in the pasture or paddock. Let it learn that your appearance does not mean it has to go to work or suffer discomfort. If your horse only runs away when it sees you coming with a halter and lead rope, then always approach it with a halter and lead over your shoulder. You have to teach your horse that the appearance of the halter and lead does not mean you are going to lead it into work. 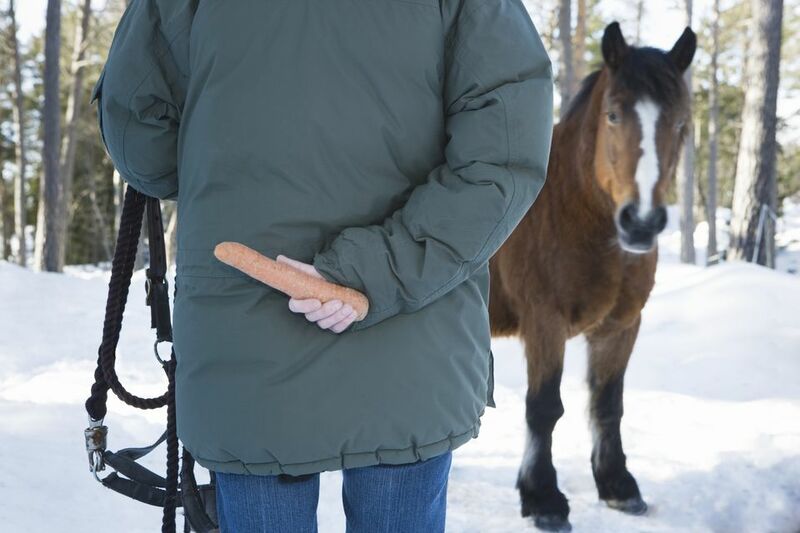 Bribing your horse with treats is only a short-term solution to your problem. You want to be able to catch your horse without carrying out a bucket or a carrot every time. And it may cause confusion among your other horses, who notice you coming with treats, and see what's in it for them. Friendly horses in your paddocks might help you out, however. If they will walk up to you for pats and scratches, ​your hard-to-catch horse will see their behavior and may imitate them. Continue to visit your horse occasionally, so that it doesn’t decide your appearance means unpleasant work.